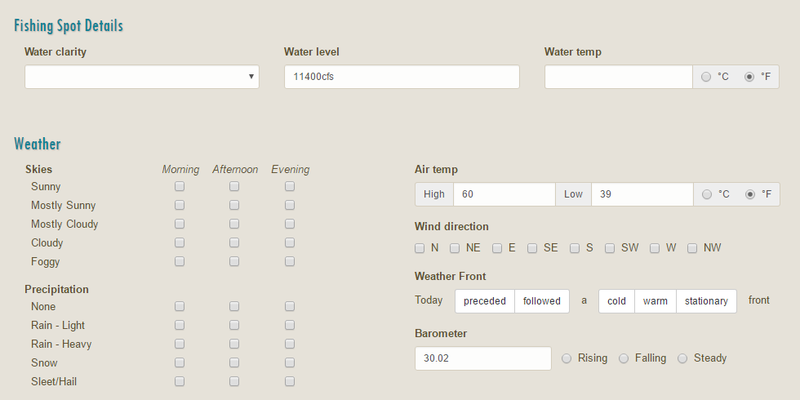 A new feature has been added to Fish Swami to help make entering in fishing logs even easier. With the help of USGS streamflow data, Fish Swami can auto-populate the water level and water temperature fields when you add a new fishing log entry. In order for Fish Swami to look up streamflow data to your fishing log, you must first link a USGS site to your fishing spot. You can link the USGS site either when you create your fishing spot, or when you edit an existing fishing spot. I’ll walk through linking a USGS site to a new fishing spot, but the editing process is very similar. 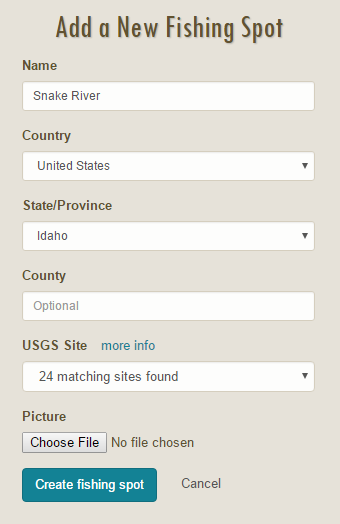 After entering in “Snake River” for the name and selecting “Idaho” for the state, the USGS Site dropdown will automatically fill in with matching sites queried from the USGS service. In this case, there were 24 matching sites found. After looking through the list, we decide that the Snake River near Irwin ID site is the nearest site to where we usually fish on the Snake River. Finally, click the Create fishing spot button to save the fishing spot information. Hopefully you find this feature useful!